The Tracking Club of Vermont, Inc. Looking for a great group of people who love to track? Spring TD/TDX at Smokey House Center in Danby, VT - April 14, 2019. 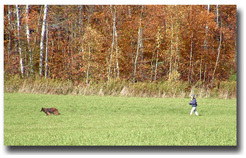 "Sport Tracking is a fun activity for a dog and handler to enjoy together. The general idea is for the dog to follow the scent left by a person walking through an area and to find an article dropped by that person. It turns out that dogs are quite good at this and naturally enjoy using their noses. We do not teach the dogs how to use their noses; they are naturally thousands of times better at using their noses than we are at using our noses. We are going to teach the dog to stay with a track until he finds the article. We teach this by showing him that it is always lots of fun to do so!" The Tracking Club of Vermont was established in 1991. Meetings are held the fourth Thursday of each month in the Rutland Area. The club holds tracking tests and clinics each year. Events and meetings are open to the public. Note: We sometimes receive e-mails from pet owners asking if we can assist them in finding their missing cat/dog. We are very sorry, but our dogs are not trained to look for missing pets or people.